We have completed the first design iteration of NIRCA – the Near Infrared Readout and Controller ASIC for Focal Plane Arrays (FPA) under contract from the European Space Agency (ESA) and the Norwegian Space Center. The project aims at future astronomical science and Earth observation missions, where NIRCA will be used with image sensors based on mercury cadmium telluride (HgCdTe, or MCT). 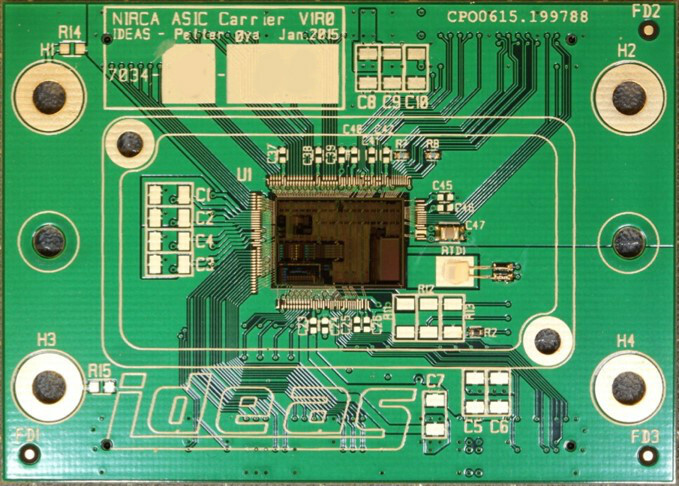 NIRCA chip for readout of focal plane arrays mounted on PCB. NIRCA is designed to operate from cryogenic temperatures to room temperature and in a strong radiation environment.The first NIRCA chips have been manufactured on 0.35um AMS CMOS and the design has been validated with respect to both radiation and temperature. The tests confirm the compliance with the essential requirements and give inputs to improve the next generation NIRCA design along the ESA roadmap for focal plane array detectors. We are planning to present cryogenic test results at the workshop on CMOS image sensors for high performance applications in Toulouse on 18. Nov. 2015. The presentation summarises the validation results and describes the cryogenic tests with the Near Infrared Readout and Controller ASIC (NIRCA). Posted in Updates and tagged Focal Plane Array, IDEAS, Infrared, Microcontroller, NIRCA, Radiation Hardened, Space Electronics, System-on-Chip.